One of the best parts of college living is dorm room decorating. This is especially true during the holiday season! You're living on your own with your dorm roommate, which means you get to create the holiday dorm room decor you've been picturing in your mind for months. Maybe the dorm Christmas tree you picture as the centerpiece of your holiday dorm room decor isn't the traditional green Christmas tree your parents have at your home. You may want to create a unique look for your dorm room decor and make it stand out from everyone else's. Where do you start? Since your dorm Christmas tree is the centerpiece of your dorm room decor for the holiday season, start with our Sky Blue Fir Tree. 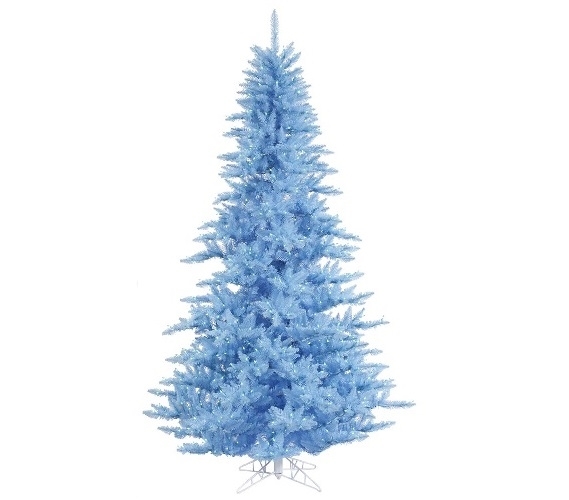 Our Sky Blue Fir Tree has light blue branches that are a soft and relaxing color. Blue is a calming color so when you're stressed from all those finals before holiday break, our Sky Blue Fir Tree will add calming tones to your dorm room decorations and make your college dorm room even more relaxing. Once you set up your college Christmas tree, you'll be adding garland, dorm Christmas lights, and ornaments to the branches. With the light color of the branches and the fact that it goes with just about any color, you can add light colored dorm room decorations to the branches or even bright or dark colors and your dorm Christmas tree will look amazing no matter what!